Snickers Cheesecake – An incredibly creamy cheesecake loaded with chopped Snickers bars and topped with rich chocolate ganache. It’s the best way to use up leftover candy from Halloween, Valentine’s Day, or Easter! In July, for my one-year anniversary, I reached out to you guys for recipes that you want to see in year two. You guys had some incredible ideas, but one really stood out to me: cheesecake! I have not made a cheesecake in YEARS. I made these cheesecake bars last fall but not a full, traditional cheesecake. I don’t know if you’ve noticed but I don’t make a whole lot of full cakes or pies. I am much bigger fan of making bars or bites or cupcakes. There are two reasons for this: (1) they are so much easier to make and (2) they’re much more fun to serve a crowd. I loath the first cut of any pie or cake because it never comes out perfectly. So I just cut out that fear by making the food into rectangular or square shapes. Which reminds me…stay tuned for a slab pie. It only seems right for me to feature one so I’ll try to get one to you this fall/winter. Okay, back to the cheesecake. When you all requested a cheesecake, I just new I had to get one on the blog. The holidays are coming up so I knew a cheesecake would be the perfect treat to serve at Thanksgiving or Christmas. And with Halloween just around the corner, too, I wanted to feature a cheesecake that you can make with all that leftover candy. I picked this cheesecake flavor for multiple reasons. First, I love desserts that are gooey, creamy, and crunchy all at once. This explains my love of ice cream sundaes and this cobbler. Second, like I said above, I wanted a dessert you could make with leftover Halloween candy. You can only eat so much of it, especially if you have multiple kids with huge bags of the stuff. I know this says Snickers Cheesecake, but you can make it with any chocolate candy bar: Milky Way, Twix, Reese’s, you name it! And finally, I wanted a cheesecake that was ultra-decadent. I am obsessed with the cheesecakes at Cheesecake Factory (helloooo Adam’s Peanut Butter Fudge Ripple!). So this cheesecake had to be almost as decadent as those cheesecakes. I don’t have to tell you that this cheesecake was one of the creamiest that I’ve ever had. You can see the creaminess right in the photos. Yummm! So how exactly does this recipe work? It’s sooooo easy. I was shocked at how easy it was. Cheesecakes (and cakes) get a bad rap for being intimidating. But don’t be afraid of this cheesecake – it’s so simple! First, you make the Oreo crust but crushing an ENTIRE package of Oreo cookies. I told you this cheesecake was decadent! Then you mix the crushed Oreos with butter and press into the bottom of a springform pan. Don’t forget to push up the edges! I missed this step so I got a super thick crust on the bottom, which isn’t necessarily a bad thing, except it makes the cheesecake hard to cut when it’s chilled. While the crust is baking, you make the filling by beating together the ingredients and folding in the chopped Snickers. I love that this recipe uses light brown sugar. It adds an extra depth of flavor to the cheesecake and a gorgeous golden color to the batter. Cheesecake always takes forever to bake, so make sure to give yourself enough time to make it. It took about 1 hour 15 minutes in my oven. You’ll know it’s ready when only a small bit in the center is jiggly. I also checked the temperature in the center to make sure it was 150 degrees before taking it out of the oven. When I pulled my cheesecake out of the oven it looked perfect – and I didn’t even need a water bath to get it that way! But I forgot that my springform pan was slightly warped so when my cheesecake cooled, the bottom fell and the cheesecake cracked right down the middle. Not a small crack. Nope, it was a like an earthquake occurred right underneath it! But, to my surprise, I didn’t freak out! I knew that I’d be adding chocolate ganache and chopped Snickers on top, so no one would have any idea that the cheesecake cracked. Did you have any idea it was cracked before I told you??? You really need to crush these cookies in a food processor. I don’t think I’ve ever been able to get a fine crumb from crushing the cookies myself with a rolling pin. But if you don’t want to buy a food processor just for this (I don’t blame you! ), you can use store-bought Oreo crumbs. You’ll need 3 cups for this recipe. Do not use a springform pan smaller than 9 1/2 inches. My cheesecake rose about 1 inch from the top. So, if I had used a smaller pan, the cheesecake would have overflowed. Make sure your cheesecake ingredients are room temperature. Cream cheese does not like to mix with liquid. But it’s much easier when the cream cheese isn’t ice cold. The butter in the crust leaks a little so make sure to bake this cheese cake on top of a baking sheet to catch all the extra butter. You must chill the cheesecake completely before adding the topping. I kept mine in the fridge overnight, just to make sure. Before placing the cheesecake in the fridge, let it cool on the counter for 1 hour. Otherwise you will shock the cheesecake AND you will end up bringing up the temperature in your fridge so all your cold goodies in there will suffer. To make ganache, you have to leave the hot cream on the chocolate chips for at least 7 minutes before whisking together. This ensures an ultra-creamy ganache that is not grainy at all. That’s all there is to it! How excited are you to try this cheesecake out now? It’s so worth the calories and the effort and the wait. Trust me. See you on Friday for the next recipe installment for Hispanic Heritage Month with Kroger! An incredibly creamy cheesecake loaded with chopped Snickers bars and topped with rich chocolate ganache. It's the best way to use up leftover candy from Halloween, Valentine's Day, or Easter! Preheat oven to 325 degrees. Place Oreos in a food processor and pulse until they turn to crumbs. Turn processor on and slowly drizzle in the melted butter until crumbs are completely moistened. Pour crumbs into 9 1/2-inch springform pan. Using your fingers, press crumbs into the pan and about 1/3 up the sides. Bake in preheated oven for 10 minutes. Remove from oven and let it cool on a wire rack. Keep the oven on. Next, chop each Snickers bar into 8 even cubes. Set aside. Put cream cheese into bowl of a stand mixer and beat on low and then on medium to get the cream cheese super creamy. Scrape down the sides. Add eggs, one at a time until mixed, scraping down the sides after each one. Add sugar, vanilla, and heavy cream and mix until just combined. Do not over-mix or else you'll add too much air to the mixture. Fold in the chopped Snickers. Pour mixture into cooled Oreo crust. Smack the pan down on the counter to release air from the cheesecake. This will prevent cracks from forming in your cheesecake. If bubbles float to the top, pop them with a toothpick or fork. Put cheesecake on a baking sheet and place in preheated oven. Bake cheesecake for 1 hour 15 minutes or until cheesecake is only slightly jiggly in the middle. Remove from oven and let it cool on a wire rack for 1 hour. Then place in the fridge and chill for at least 7 hours or overnight. Remove cheesecake from fridge and remove springform liner from cheesecake and prepare the topping. Place chocolate chips in a medium bowl. Heat cream over the stove until scalded (but not boiling!). Pour cream over chocolate chips and let them sit for 10 minutes without mixing together. This will ensure a creamy consistency. Whisk mixture together until all the chips have melted into the cream and the ganache is formed. While you wait, chop each Snickers bar into 8 cubes and set aside. Pour ganache over the top of the cheesecake, making sure to cover any cracks that may have formed. Allow the ganache to pour over the edges of the cheesecake. Top with the cubed Snickers bars. Serve immediately or store in the fridge for up to 2 days. Has anyone actually baked this cheesecake? Can’t see any commenters with real feedback. Umm… this looks DELISH! I’d love to eat a slice right through the computer screen! OH MY! I know what I am making for dessert for this party this weekend. This looks so tasty! I’ve been craving cheesecake lately – I’ll have to try this! Oh my goodness these look and sound delicious! 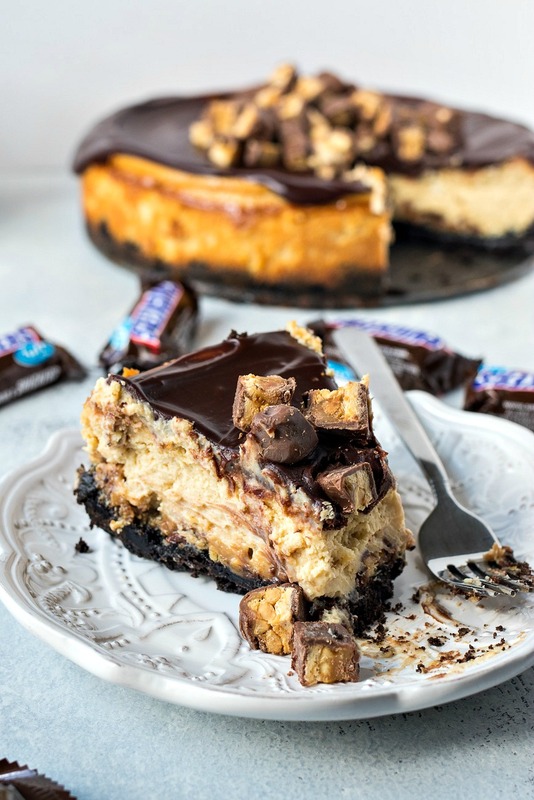 This snickers cheesecake has me drooling!! Definitely have to try some! Yeah, I pinned this just because of your crack-hiding genius. My mom makes perfect cheesecakes, and the ones I’ve done inevitably have either a crack or a toasted middle, so I just kind of quit trying, and let my mom have the incredible cheesecake. Probably going to use a decadent topping for all time now, thanks! Yes! So glad you have a trick now. Let me know how it works for you! OMG, that looks decadent and delicious. I am sure that it must disappear when you make it. Thanks so much! It sure does! This is literally mouthwatering and just makes me crave for something sweet. Pinning for later. What a great way to cover the crack Seriously, this looks like a fabulously delicious dessert! Haha thanks! You can’t even tell it existed! Yum! This looks amazing! I need to make this immediately! Whooo! I’m diabetic, but this would be an excellent cheat dessert! OMG!! My two favorite things put together = heaven. Can’t wait to try asap — thank you fro sharing! I love snickers and I love cheesecake so perfect combo. This looks to die for!! Mmmmm….This Snickers Cheesecakes looks so darn scrumptious. I literally want to lick the screen! Omg!! Cheesecake is my weakness and this one looks to die for!! Yummy! I can only imagine how incredible that tastes! The cookie crust, the snickers on top, and cheesecake– be.still.my.heart! Oh man, my mouth is watering! I have never made a cheesecake and always thought it seemed easy to screw up, but you’ve almost convinced me it might be doable. I love Snickers! My kids LOVE Snickers and Oreos. Might have to make it for a birthday! This is the most decadent, delicious-looking cheesecake I’ve ever seen! Looks amazing! Yum! I’ll be saving this recipe for my holiday cheat days! Yes! You’re gonna love it! Just WOW. How decadent and delicious! I’d love to test this out for Thanksgiving. this looks soooooo yummy! Your photos are beautiful too! Oh my! This looks SO good! We love cheesecake at our house, and I can’t wait to try this! Us too! I need to make it more often. Let me know if you have any recipe suggestions! I’m drooling right now! Can’t wait to try!